Israeli PM outlines reconciliation deal; Gaza blockade to remain, Turkey to prevent terror against Israel, help return captive Israelis. 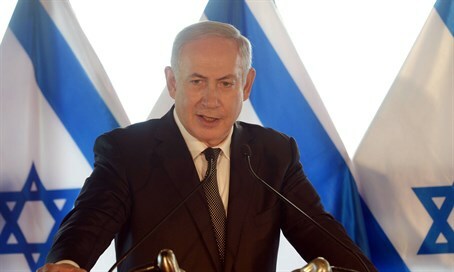 Israeli Prime Minister Binyamin Netanyahu officially announced Israel's reconciliation deal with Turkey, at a press conference in Rome on Monday afternoon. The deal has faced fierce opposition within Israel, where many critics have blasted it as a reward to terrorism. Under the deal, Israel will provide $20 million in compensation to the families of jihadists killed aboard the Mavi Marmara ship, which in 2010 attempted to violently break Israel's blockade on Hamas-ruled Gaza. That is in addition to an official Israeli apology - which has already been issued - and a deal to allow Turkish humanitarian aid into Gaza via Israel. In exchange, relations between the two one-time allies will return to normal, and talks will commence on a potentially lucrative natural gas deal. Speaking in Hebrew from Rome, Netanyahu repeatedly emphasized that - while he did not view the situation through "rose-tinted glasses" - such a deal was of critical "strategic importance to the State of Israel." In particular, Netanyahu noted, paving the way to exporting natural gas to Turkey would provide an enormous boon to the Israeli economy - to an extent which shouldn't be understated, he insisted. But he also highlighted several other concessions which Israel had garnered from Turkey. Under the agreement, Ankara had pledged to "prevent any terrorist or military activity from Turkey soil against Israel" - including fundraising for anti-Israel terrorism. Such a pledge is particularly significant given the use of Turkey by Hamas's leadership as a hub for planning and coordinating terrorist attacks. Netanyahu also addressed the parents of missing Israelis, both dead and alive, who are still held by Hamas. Israel had received a letter from Turkish President Recep Tayyip Erdogan, in which the Turkish leader pledged to work for the release of the Israeli captives and bodies as a humanitarian service. Turning to the families, Netanyahu assured them that Israel hadn't abandoned their loved ones. "We won't stop until we return them home." On the contrary, he insisted, while the agreement hadn't secured their release - something he told reporters was impossible given that Turkey held only "influence" over Hamas, not "control" over its decisions - "without this letter there's no chance. With this letter there is a chance." In addition, he said, Turkey has committed to supporting Israel's admission into international agencies which it is a member of - including, crucially, by supporting the opening of an Israeli mission in NATO's Brussels headquarters. Israel had long worked to open a mission at NATO, but Turkish opposition had blocked it from doing so. Jerusalem's recent breakthrough in Brussels was long speculated to have been the result of talks with Turkey. The Israeli PM brushed aside charges by the deal's opponents that it was essentially a surrender to terror. In particular, he mocked left-wing politicians from the opposition, who he noted had for years loudly called on Israel to make even greater concession's with "the most powerful Muslim country," only to suddenly change their minds to score political points against him. "I work in accordance with the interests of the State of Israel," Netanyahu continued. He also referred to the fact that Turkey had in fact dropped its major demand: that Israel end the blockade of Gaza, telling reporters that the reason the deal took so long to strike was due to the fact that Turkey had initially refused to "drop certain demands we weren't prepared to meet." "The second thing the agreement gives is continuation of the maritime security blockade off the Gaza Strip coast," he said. Instead, Israel will facilitate the transfer of humanitarian aid via Ashdod - a purely symbolic concession given that huge volumes of such aid already pass via Israel into Gaza.